Triad History Day is a free one-day public festival focused on Triad history, both the stories and the people who preserve them. The event will feature a “history hall” with displays from history organizations, a series of lightning round talks focused on local history, as well as booths focused on oral history, preservation advice, and digitization of community materials. Visitors can learn more about local archives, museums, libraries, and other historical organizations in the “history hall.” Participating institutions include representation from all over the Triad. See the complete participating institution list below. Visitors with photographs or other records that help document Triad history can bring materials to the scanning station at Triad History Day. There, archivists will scan the materials for inclusion in UNC Greensboro’s community history portal. Visitors will also receive a copy of the scan. An oral history booth will allow participants the opportunity to record a 15-minute interview about an interesting story related to the Triad region. Interviews may involve two friends having a conversation, a family member interviewing a family member, or an individual being interviewed by a UNCG graduate students serving as an oral history facilitator. 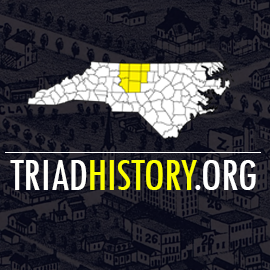 Interviews would be made available through the TriadHistory.org digital collection portal. We hope you’ll join us for a fun celebration of Triad history!